Anyone who would like to extend the life of their Pebble smartwatch battery, may be interested in a new Pebble battery strap that has been created by Ka Wai Wayne Leung, based in Hong Kong called the EZIO PowerBand for Pebble. As the name suggests the flexible PowerBand for Pebble. battery strap has been specifically designed to extend your Pebble smartwatch usable life with the Pebble Time being able to enjoy an extended 11 day battery life while the Pebble Time Steel is capable of last 14 days on a single charge. 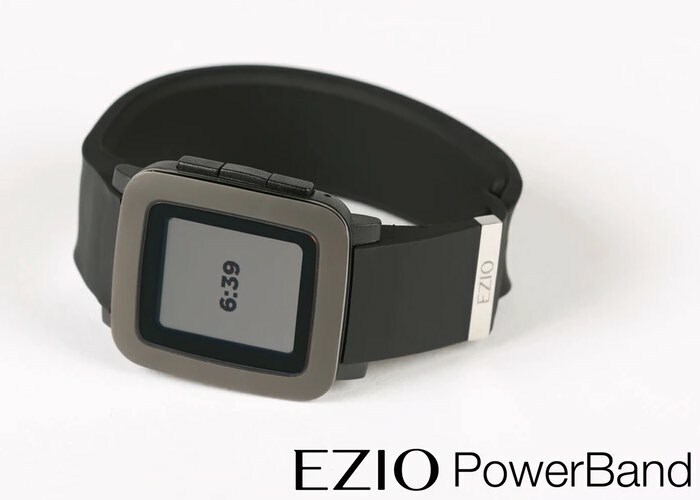 Check out the promotional video below to learn more about this new EZIO PowerBand for Pebble which is taken to Kickstarter to raise the $58,000 CAD it requires to go into production. The EZIO PowerBand is the world’s first-ever flexible battery strap built for Pebble Smart Watch. With the EZIO PowerBand, the Pebble Time and Pebble Time steel can be powered for 11 and 14 days respectively. To charge the EZIO PowerBand, we have developed an adaptor that can charge both the PowerBand and the watch at the same time by simply plugging in the original USB charging cable to the adaptor and attach it on the back of the pebble watch. It only takes five hours to fully charge both the PowerBand and the pebble watch. – Inner-Circumference: Min 165mm – Max 204mm to fit most wrist size. For more information on the new EZIO PowerBand for the Pebble smartwatch jump over to the Kickstarter website for details and to make a pledge from $63 CAD.